Today was a pretty intense day. We went to Layla House after breakfast to look around a bit, give Manyazewal a chance to see some friends (and, I think, to show off a bit… new back-pack, new shoes, new parents), and, oh yeah, to meet Manyazewal and Mihret’s mother. She had traveled overnight from Harar (East of Addis Ababa) to meet us and say goodbye (again) to the children. I think we were almost more nervous about meeting her than about meeting the kids. It was with great trepidation that we made our way into the social worker’s office. She greeted us as one greets friends in Ethiopia (kiss right cheek, kiss left, kiss right, kiss left, “Seulam”). She looked tired. She had been very sick over the last few months. The antiretroviral drugs, while extending her life, were also taking a great toll on her body. But that toll, I think, was not as great as giving up her children. The pain in her face when Mihret did not recognize her conflicted with the joy in seeing her children and the peace at knowing they would be taken care of. She was so very gracious with us, but it was obvious it still hurt her when Mihret called Julie and I ‘mama’ and ‘abba.’ As hard as we thought the meeting might be, for her it was so much harder. We talked for a while about how she was doing. We talked about her choice to give her children up for adoption. We talked through the social worker, who translated for us. (All this while Mihret wanted the camera, and the water bottle, and the door knob, and…) She pulled out a wonderful gift: a photo album with pictures of her family, and of the kids. She asked about Oregon, and we gave her the book we’d brought for her showing all the faces of the state. 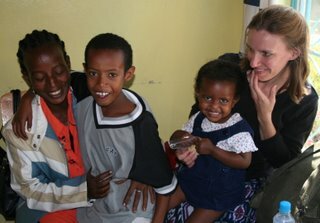 She gave us a sack of peanuts (a specialty in Harar) and we gave her a box of chocolate, a specialty of Harry and David. It was all very hard but very nice but very formal. I cannot imagine how impoverished our lives would have been if we had decided against meeting her. I cannot imagine how much pain would still be in all of us if we had not sat and prayed together, claiming our common heritage and embracing as brothers and sisters in Christ. It was not easy, and I am sure there will be more tears shed on all sides. But this I know: by the grace of God, this story has a happy ending for ALL concerned. At the gate we embraced again. She blessed us in Amharic; we blessed her in English. She went to find a taxi for the long overnight drive back to Harar. We turned to be swept up in the energy and chaos of a mass of kids who all seemed to want to have their picture taken (at the same time)… kids who, most likely, have very similar stories to ours. Our worlds, for the moment, diverged. But all roads lead to home, and someday, when our journey is complete, we will laugh and celebrate together as we join in the greatest family reunion of all. I’m looking forward to it. I can't say "thank you" enough! You have taken the time and energy to share your most personal experience with all of us, and it is a tremendous gift! But even more, is the gift of showing us all (on the other side of the world), Christ in the flesh. We have been blessed to see Him in the words and actions of you, Chris, in you Julie and in Manyazewal and Mihret’s mother. (Matthew 19:17.) I would say your story is unbelievable, but then… with Christ, all things are possible… So I guess I should say “because Christ is so alive in you, your story is SO believable!” THANK YOU! We love you and can’t wait to hug you all!!!! Love, auntie Heather. We adopted our children from SOuth America just short of a year ago. I want to tell you what a true blessing this meeting and this account of it will be for your children in their future. How wonderful to know that this family is truly being formed by God and that you are all following his plan. Your children will know that they are truly special and that God has big plans for them. Thanks so much for your touching updates! We were delighted to read about your loving, joy-filled meeting with Manyazewal and Mihret, and then your God-ordained time with their birth mother-wow! We miss you here and are anxious to have your whole family together. God bless you on your journey home. I have goosebumps! What an amazing God we have! Thank you so much for sharing your personal and incredible story with all of us. You all are a blessing and inspiration! Praying for a safe journey home. Can't wait to see you and meet the newest members of the family. Thank you for sharing such an amazing story. We are praying for each member of your family and look forward to your safe return home. It will be wonderful to bring Moges home later this fall to an even larger extended family in the valley.